Not sure which bookbinding leather to choose? 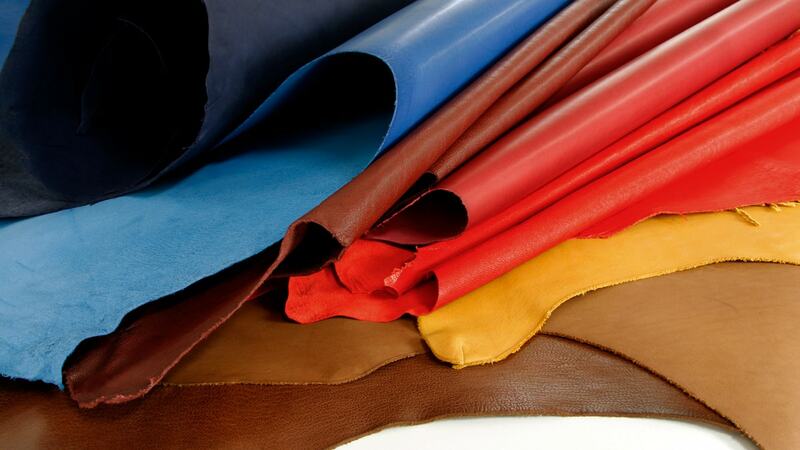 When it comes to selecting leather there are many options to choose from. Below is a guide to navigating our selection of hides, but we are always available by phone or email to discuss your specific requirements. Tanning is a method of using specific chemicals derived from minerals, plant matter, or oils that fix to the fibers of a skin to prevent bacteria and atmospheric conditions from breaking it down. The selection of leathers that TALAS provides are traditionally vegetable tanning agents (environmentally friendly not using chemicals), which provides longevity of the leather and aniline dyed, suitable for gilding and blind embossing. The process of tanning is labor intensive, and takes about one month from raw hide to final trimming and measuring. In a nutshell, the process includes dehairing (cleaning the hide), fleshing (evening and cleaning the backs), tanning, drying, dyeing (using aniline dyes), and finally finishing! Goat is by far the most frequently used skin for bookbinding. Goatskins are small, supple hides that pare* easily, with a high-relief grain that wears well over time. TALAS carries several lines of goat, all of which are vegetable tanned, aniline dyed, and suitable for gilding and blind embossing. *Leather paring is the process of thinning leather to make it suitable for bookbinding. Calf are larger skins, with a smooth finish and a fine grain that shows off tooling to great advantage. The surface is absorbent and lends itself well to additional dyeing. Ideal for larger templates. Sheep is the softest and most pliable skin, also with a smooth surface, which can make it vulnerable to damage. They have historically been very popular for use in full leather bindings, and are an economic alternative to goat or calf. Most leather hides are broken down in different qualities. Qualities differ between tanneries, but are typically 1st, 2nd and 3rd. All of our hides are sold by the square foot, which includes the neck and feet. These are natural products and each hide will differ slightly as to its yield. Please contact us if you have a specific template size and we will try our best to find a hide that meets your needs. Different grain patterns can offer a range of both visual and tactile textures without affecting other qualities of the leather. Our hides are available in a wide range of beautifully saturated colors. There may be slight variations from dye lot to dye lot. Please make note of this when purchasing multiple skins. Skins referred to as “Fair” are undyed and suitable for custom dying. Hewit aniline dyes can be purchased here. For customers in search of white hides, we carry a pigmented white goat leather in the French Chagreen, as well as a selection of Alum tawed skins that display the characteristic natural white of the tawing process. Russell’s Oasis Goatskins are produced in a wide range of colors with a natural grain, averaging 5 – 8 square feet and available in 1sts, 2nds and 3rds. Restoration Calf by Russells are full hide skins in a selection of natural and dyed neutrals. A valuable alternative at a economical price. Harmatan Leathers are created using tradition methods in the UK. Established in the 1980s to supply the finest quality vegetable tanned goatskins and smooth grained calfskins specifically for bookbinders. Harmatan Goatskins are produced in an equally large range of colors with a natural grain, averaging 4 – 5 square feet and available in 1sts, 2nds and 3rds. Harmatan skins are known for their signature modulated coloration. Harmatan also produces Kaduna (embossed) Katsina (pigmented) and Morocco Grain (embossed). J Hewit & Sons has a 200 year history of manufacturing the highest quality leathers for bookbinding and leathergoods production. It is a family run business that is now on its 7th generation, also located in the UK. J Hewit & Son Chieftain Goatskins are produced from the hide of larger goat, averaging 6 – 9 square feet, with a “shrunken” grain, a natural polished finish, available in 1sts and 2nds. Hewit Bookcalf Calfskins are produced by J Hewit & Sons, the world’s most renowned tannery for bookbinding calfskins. The unique production of these leathers involves a final finishing on plate glass which gives these skins an incredibly smooth and polished aesthetic. They average 7 – 10 square feet, and are available in 1sts, 2nds, and 3rds. Repair Calf by Hewit are half kip sides produced in a selection of historic browns, and have a more matte, rustic finish and are suitable for repair and conservation work. They average 6 – 9 square feet and are available in 2nds and 3rds. French Chagreen Goatskins are available in an extensive range of attractive colors, averaging 4 – 5 square feet, hand-boarded and of the highest quality. French Split Goatskins have a natural grain, average 4 – 6 square feet, are available in 1sts and 2nds and do not require paring, having been pre-split to a thin substance. Alran Goatskins are produced to TALAS specifications, averaging 4 – 6 square feet, hand-boarded, available in 1sts and 2nds. An economic alternative to the French Chagreen. Franz Hoffmann Archival Calf is a range from Spain of both neutral and colored skins, smooth with a matte finish. Avg size is 6-10 sq ft.
Franz Hoffmann Bovine (Calf) are exquisite hides, durable yet soft, easily pared or thinned and priced at an affordable level, avg 11-14 sqft. Franz Hoffmann Split Goatskins range from undyed to mineral tanned and a small range of basic colors. Ideal for book covering and do not require paring, average : 4-9 sqft.